My Life in Second Life: You are heroes! Thank you to everyone who lent their ears for War Child yesterday. Thank you for sharing your stories and for offering support for the organization. This means a lot to me personally, but, more importantly, to those children who benefit from War Child's actions. The organization works closely with the music industry to raise money to provide services for children affected by war. We listened to the compilation Heroes, which you can read about here. The most obvious way that children are affected by war is through death and injury (in the past decade, more than 2 million children have been killed and more than 10 million injured or disabled in armed conflicts). Children may also lose their homes and families, making the trauma of war even harder to cope with. Many creative projects are being done by War Child to help children recover from war. For example, "Creative therapy children's buses" travel around Kosovo to provide creative workshops for children in different areas. Check out War Child's website at www.warchild.org/projects/projects.html to learn more or contact project managers Chriistopher Carter and Sara Caproni in-world. Please consider purchasing the album - it's aces - or joining the group in-world. 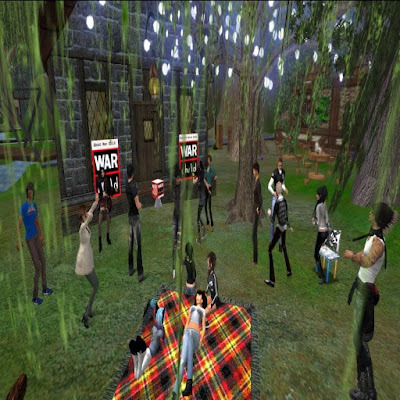 Stay tuned for the opening of War Child's sim next week which will offer live music events and other activities. Thanks again, friends <3.